Everything is in very good looking condition. Everything in correct working condition. I feel that most issues can be resolved together in a win-win situation. Ticket number 560136-150. 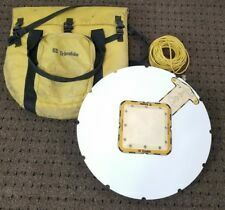 TRIMBLE MICRO-CENTERED L1/L2 ANTENNA WITH GROUND PLANE IN PADDED CARRY BAG--ALSO INCLUDES TRIMBLE TSC1 DATA COLLECTOR. --ALSO INCLUDES TRIMBLE TSC1 DATA COLLECTOR. ANTENNA IS IN GOOD WORKING CONDITIONS. (1x) Trimble L1L2 Micro-Centered Antenna and Ground Plane. - PN 33429-00. I feel that most issues can be resolved together in a win-win situation. "Item is not as described" claim. When you need to send or receive radio frequency signals, it helps to have the right size and type of antenna. A quality antenna allows you to receive signals from a considerable distance while minimizing any interference or static in the transmission. On eBay, you can choose from a range of brands, sizes, and features of ground plane antennas at affordable prices. What are some features of ground plane antennas on eBay? Rust and corrosion resistance: These antennas can withstand constant exposure to the elements. Tuning in the field: You can update the tuning of the antenna while in the field. Wind speed: The antennas can withstand wind speeds of up to 100 miles per hour. Ease of assembly: The antennas can be set up and taken down within five minutes. Bandwidth: These antennas can be tuned within 10 MHz bandwidths. What are the mounting options for a ground plane antenna? Magnets: The antennas may work with a set of magnets for affixing to a magnetic surface, such as the roof of a vehicle. Base mounts: These work for base station radios and for rooftop applications. Chimney mount: This allows the antenna to extend outward and upward from the brick-and-mortar surface of the chimney. Telescoping mast: This allows you to mount the antenna from the ground with guy wires and cables. What are the available types of affordable ground plane antennas? Vehicle: These antennas work with CB radios and can be installed with magnetic fittings inside or outside of the vehicle. Portable: Use this type on mobile radios or for field applications. Base station: These work with base station ham and amateur radios. House: These units are designed to mount onto the roof of a structure, such as a house. How do you choose a ground plane antenna on eBay? Condition: There are new, used, and refurbished options available. Kit: Choose just the mast, the disc and mast, or a kit that includes mounting hardware, cable, wiring, antenna, and the mast. Brand: Some of the options include Workman, Wilson, and Shockwave. Capacity: The range is 100 to 500 watts. Material: Select stainless steel, aluminum, or fiberglass.